During the Saturn years, Sega's famed Sonic Team took a break from developing Hedgehog games. But amidst the blue blur's absence, two originals came to fruition. 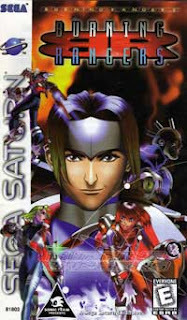 The first appeared in 1997 and was to do for the Saturn what Sonic the Hedgehog did for the Genesis. Even though it didn't quite reach that level of success, the game still became a cult classic and eventually found a sequel on the Wii. This, of course, was Nights into Dreams. But there was another - one that managed to fly just underneath the general gaming radar. 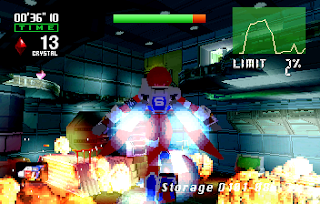 Released in '98 towards the end of the Saturn's life, little fanfare was made for Sonic Team's other gift to the Saturn: Burning Rangers. The premise behind Burning Rangers is pretty straightforward: futuristic firefighters tackle flames and save lives. Besides some gibberish towards the end about a girl trapped in a crystal, the story is pretty bare. Fight fires with your laser. Survive, repeat. I'm not arguing though, as it's almost refreshing in its simplicity. 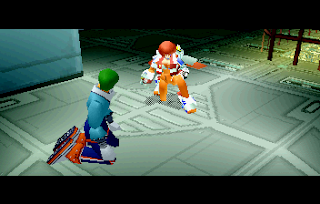 Players initially take the roll of either Shou or Claris, one of two identically-playing rangers. Regardless of the character, the overall story stays the same, with just a few differences in the script and subplots. After a brief training mission to introduce the controls, the first mission begins. To extinguish fires, the Rangers must shoot the flames with either a quick laser blast or a charged-up grenade-like shot. As the flames are put out, they're turned to crystals, which function exactly like rings do in Sonic the Hedgehog. As long as at least one crystal is in possession, the characters can take a hit, but in turn, their crystals are sent flying through the surround area. Get hit with no crystals and it's game over. Careful, though, as using the grenade blast will destroy any crystals in the area. It's a trade-off: use the grenade shot to quickly put out the fires or shoot them one-by-one and hopefully survive long enough to get more crystals. Crystals do have another use - rescuing people. Hostages are spread throughout the level and they need to be saved. Now, it's completely fine to ignore them, but if enough crystals are on hand, the Rangers will transport the hostages away to safety, and possibly earn a continue in the process. These guys and gals also act as save points, essentially serving the same function as lamp posts do in the Sonic games. Of course standing fire isn't the only obstacle, as bursts of flames will shoot out of the walls. Before a blast ignites, there is a short whistling sound. Tap back on the d-pad in time and the Ranger will jump out of the way avoiding any damage. Too slow and the kids get burnt instead. Though the move fairly easy to pull off in the first episodes, it does get tricky in later ones, necessitating a quick reaction time. What would a Sonic Team game be without bringing time into the mix? If fires aren't being put out fast enough, then the entire level will be engulfed in flames, reminding players to hurry the hell up and completely agitate them in the process. A counter on the side of the screen shows a fire percentage level. For every 20% increase, there's a boom and a ton of flames. This level never drops below the last 20th percent, so if a 58% is reached, it can be worked down to 40%, but not lower. Levels are basically glorified corridors; nice looking corridors, that is, but still just corridors. To navigate through these, Shou and Tillis can radio Chris, the navigator, and she'll send out verbal directions. Sometimes it works, sometimes it doesn't. The game can get really frustrating when there's a switch that needs to be pressed, and Chris keeps sending the wrong directions over and over. With everything looking like one giant hallway, it's fairly easy to get lost, too. Getting from point A to B is only part of the battle, since the controls in this game are loosey-goosey, to put it mildly. While not necessarily a bad thing, it does make accurate jumping seem tricky. And there's a ton of jumping, as the Rangers leap from one platform to another, over pits, and out of the way of fire. It's pretty easy to miss a jump or a landing along the way. To help avoid random falls, an auto-jump feature has been added. Anytime the Rangers get close to the edge of a surface, they'll jump off automatically. This can get pretty annoying. Sometimes, it'll be a life-saver, as the rangers can float back onto a platform instead of falling off entirely, but most of the time, it just feels unnecessary. Spend enough time in the game, though, and it does become tolerable. Underwater segments appear in certain levels, and these are, well, a mess. There's a button for jet-blasting upwards and downwards, both of which push the Rangers forward. If the jumping wasn't loose enough, the water takes the cake. It's hard to control, hard to aim, and the cameras completely lose their focus underneath the waves. That's not to say that the cameras are anything in the first place. As with the game's platforming contemporaries, the cameras in Burning Rangers are pretty bad. While not an absolute deal-killer, it's definitely Burning Rangers biggest problem. Sometimes the camera does a good job, but it's easily thrown out of alignment. Nothing is worse than trying to make a jump, only to have the camera shift into a position where the destination is completely unseen. Worse yet is when the camera gets caught in a corner, only to display portions of the wall in front of it. To help remedy the situation, cameras can be adjusted freely or in 90 degree increments. Despite the bad camera work, there's still fun to be had in the game. When it all works, the game is enjoyable and provides a good test of skills, racing through the levels, keeping the fire down, and trying to do it all in a timely manner. It's possible to get used to some of the annoying things (like cameras and auto-jump) and even learn to work around them, but it shouldn't be necessary to adapt to the game's faults. 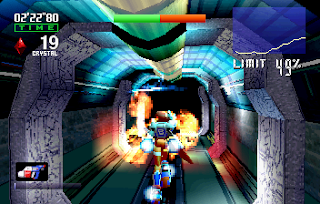 After making it through the level, players are greeted with a boss. Most are tied in with the theme of the level, but they're pretty ridiculous, consisting of monstrosities like a fire-spewing plant and a large angry fish. Really, the bosses aren't necessary at all and feel a little tacked-on. Fortunately, they're fairly quick and easy to defeat and they do change up the pace. Once the level is completed, players are graded, just like in Nights. Ranks go from D to S, with S being the best. The final grade is based on how many hostages were rescued, the number of crystals remaining at the end of the level, the time taken for the boss, and the flame percentage. Repeat this for another three levels, and that's Burning Rangers. Along the way, there is a shooter mini-game tossed in for some variety, but that's pretty much it. As with Nights, Sonic Team keeps the number of levels low, but open enough to be replayed several times for higher scores. To reduce the monotony, BR features a random-level generator. This feature has been touted by the press and fans of the games, but to be honest, it's not that big of a deal. Take the same levels, open a couple of doors that were closed prior, put the hostages in a new spot, and play. Hostages and switches may never be in the exact same position twice, but once a player learns the usual locations for hostages and switches, they're set. If shooting for high scores isn't your cup of tea, then there's the Pokemon allure - "Gotta catch'em all." This time, it's the hostages that need to be collected. After rescuing someone, they'll send out a quick e-mail. Sometimes it's a code to unlock an extra feature or artwork, but other times it's just nonsense. With hundreds of hostages and several e-mails from each one, it takes a while to get them all. Whether it's worth it or not, it's up to the player, but for those 100% completists (myself included), it's a reason to play through the levels again. Graphics are impressive. 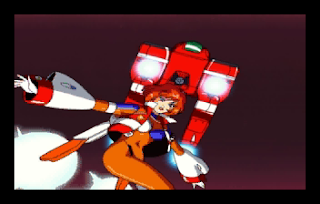 Running off a modified Nights engine, Burning Rangers takes the Saturn and pushes it to its limits, and then some - maybe too much. The graphics look great, but suffer from some pretty bothersome slowdown. It's not like Sega Touring Car, where the frame rate is awful the entire time, but when the flames hit the fan, the frame rate takes a nose dive. Excluding that frame rate and occasional clipping, this is one of the best looking games on the Saturn. There are tons of transparencies and lighting effects all over the place, perfectly suited to a game about fire. Light coming from fluorescent lamps fill the air. The after burn of the Rangers' rocket packs looks great as well. I see it all and I really think this game would be so much better on a later-generation system like the Dreamcast. The Saturn tries and it chugs along, but there is just too much for it to handle. Sound is solid as well. There's not a whole lot of background music, so mostly explosions and radio chatter fill the airwaves. Hearing the other Rangers converse over the radio helps flesh out the barebones story and add a little depth to the very flat characters. When music does kick in (usually during a boss battle), it's pretty solid, if not generic. All in all, I have to say that I do like Burning Rangers, but it's definitely got its flaws. For Sonic Team fans, this is another winner, but for the rest of the world Burning Rangers is pretty average. For every thing it does right, it seems like the poor cameras, slowdown, or loose controls throw it off. On the right system, with hardware that could handle the game's visuals and some extra development time to tweak up the controls, Burning Rangers could've been a real winner. As it stands, it's only average.